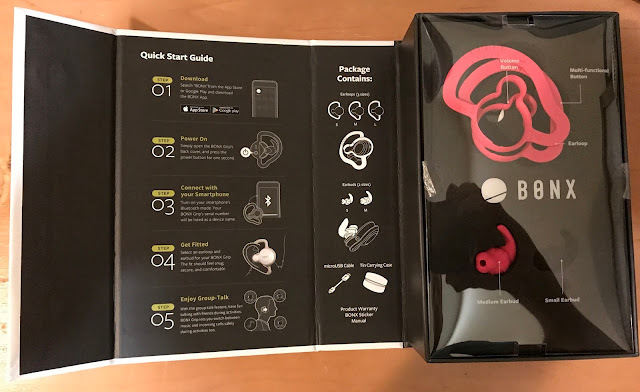 I've had the opportunity to field test a pair of Bonx Grip communication headphones, and I've never experience communication so seamlessly with another person without the direct use of a cellular device, or face to face. Please enjoy my review below. The presentation of the Bonx Grip headphone comes in a rectangular box, included is the earpiece, 3 sizes that secure the unit around your ears, and 2 interchanges ear buds to find your perfect fit. If you're someone who travels a lot, you'll quite enjoy the carrying tin that easily fits your Bonx Grip headphone as well as the micro USB charging cord. Once both units were fully charged, pairing the Bonx Grip to my phone was simple by holding the covered power button down for a few seconds and connecting through my settings app on my phone. This pairing allowed me to listen to music and answer calls like any other Bluetooth unit, but where the Bonx Grip differs is all in their app. I downloaded the Bonx app on both my phone and my wife's phone. My app recognized my unit almost immediately and I was able to create a talk room which created a passcode that I shared with my wife. We were then chatting like it was a cell phone and it was instantly based on a strong cellular signal. For ease of connection, your talk room doesn't expire for about a week so connecting to each other was as simple as opening the app and sliding a toggle each time we needed to connect. The way the communication works is through your cellular signal or through a wifi provider. You can choose to talk hands free or there is a push to talk button which allows for more privacy. This option was quite handy as when my wife and I tested the Bonx Grips, I didn't need to listen to her singing during our entire bike ride. With the hands free option, the Bonx Grip learns your voice to allow a seamless user experience This limits the unit from picking up nearby voices and adding unwanted conversations to your experience. The Bonx Grips also provides noise cancelling technology to eliminate wind noise. Simply talk and the unit sends your voice message directly to other users in your talk room. Currently you can add up to 10 users per chatroom. Our ideal testing included myself cycling while pulling my three year old daughter in a cycling trailer. My wife was behind us approximately 30-50 feet like always. We usually ride this way for safety to keep other riders and vehicles away from our daughter. Doing so, there was no way in the past that we could carry on a conversation, until now. 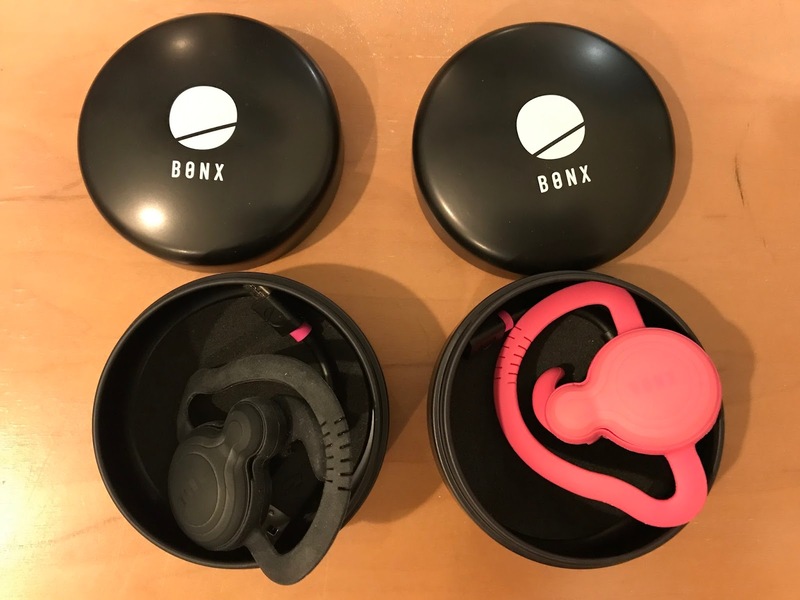 What I learned was that while using the Bonx Grip as a headphone, music was loud and crisp. The battery life was amazing and after the initial charge, I'd used them for over three hours and the battery indicator still shows about 50% battery life remaining. When the two way communication was activated, you can still enjoy listening to music, but the volume is drastically reduced for safety. Since this is a data based system, you'll need decent cell service. Our service around our house is not great so we had to cycle about a mile to truly test the units. That being said, the Bonx Grip does an excellent job reconnecting as soon as possible and there's nothing that the user needs to do for reconnection. The Bonx Grip has two physical buttons on the outside. The larger button acts as the push to talk option, and the smaller button provides a mute option. The larger button is easily assessable while wearing gloves during winter sports. To turn the unit on/off and to pair, there is a flap on the inside of the unit with a small round button. You can also find the charging port under this flap. It's also shock and water resistant for those rugged sports. (IPX5 Waterproof) The approximate weight is 15 grams, which feels like it's floating on your ear. I did not feel any discomfort while using the Bonx Grip. My wife and I are a busy family with 3 kids, and 2 dogs. We try our best to ride as often as time permits. We often take turns and we use to rely on Apple's IPhone app "Find my Friends" to ensure safety and to make sure each other didn't need immediate assistance from the other. The Bonx Grip gives us the option for one of us to use the headset while still at home connected to our wifi, as the other goes out for a ride with constant communication. This is a huge plus in my books, and I wish we had this technology years ago. We actually have plans to use these units for more than sports. How perfect would these be at an amusement park, concert, or even at a shopping center. Bonx Grip gives you the ability to immediately connect to your friends and loved ones, with no more hassle than talking to someone who was standing right in front of you.